House Tour: Glamour & Chic Little Girls’ Bedroom — KTJ Design Co. I have two sons whom I absolutely adore, but I’ve always longed for a little girl. While I never had a daughter, one of my sons did! Hallelujah. When I get to spend time with my two granddaughters, I love spoiling and pampering them. Because I often have them stay the night, I wanted their room to make them feel special and their memories of Grammy’s house to fill their hearts for a long time. When I remodeled my home late last year, I decided to re-decorate the bedrooms. 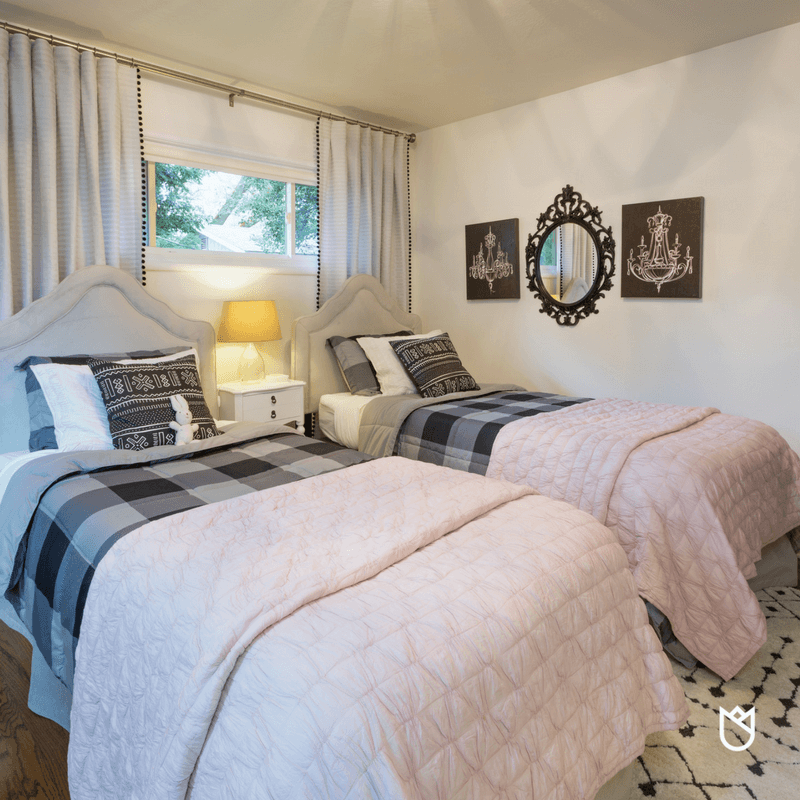 From fresh paint, bed linens, décor and storage organization to window treatments and rugs, decorating this glamorous bedroom for young girls was a delight. Continuing the black and white theme from the rest of the house (see this blog post about my kitchen remodel), I had to add just the right amount of blush via the bed linens and décor items. The room itself was blessed with original built-in shelves and millwork around the window. I painted them a crisp white. I placed an assortment of baskets and bins on the shelves to hold small toys (those Barbie doll accessories are tiny). Collections of books (some of which I’ve had for over 30 years) are ended with unicorns (a favorite of little girls around the world). I included several ferns for greenery as well as a cute cactus with pink flowers (placed out of the way so they won’t get hurt). The cactus gets plenty of sunshine from this west facing window. The shelves are decorated with things the girls love, like mermaids, Paris, elephants and cherished stuffed animals. I put a TV in their room because they love to watch Netflix non-stop (I can’t tell you how many times I’ve seen the same show about “Camp Kikiwaka”). Getting the beds and bedding just right for my precious girls was important. I opted to get motorized beds that are incredibly comfortable (and convenient for TV viewing). The Enso Sleeping System offers the greatest in comfort and technology at a price point that won’t break the bank. I’m a dealer for this line and we LOVE it. The empire-style custom headboards are covered in a soft gray velvet with matching bed skirts to complete the look. The custom drapery might be my favorite item in this entire room. Coordinating with the headboards, this drapery fabric is another example of a soft pin-tuck look. When I first designed these drapes, they didn’t have the black pom-poms, but once they were hung, I knew something was missing. They came down and the pom-poms were added, making them bring all the coordinating elements together. Notice how I hung the drapes close to the ceiling over this long, narrow transom-style window to make them look taller? If I had put the drapes a few inches above the window the whole room would’ve looked shorter. Note: The roller shades are all the way up on the windows in these phots, but I added them as extra privacy, security, and insulation. Finding the perfect ceiling lighting was simple, once I saw this flush mount piece by Artcraft that reminds me of curled ribbons. It emits a magical light show on the ceiling. We have plenty of natural light, soft lamps, and overall lighting in this room—ideal! Are you decorating a girl’s room? The designers at KTJ Design Co. can help. Schedule a Remodel Clarity Session so we can brainstorm to create a magical, sophisticated room for your little darling.